EPR Properties offers a juicy dividend yield to investors. The REIT continues to invest into its asset base, which will allow for further FFO growth. 2019's funds from operations will be down from 2018, but there is a good explanation for that. 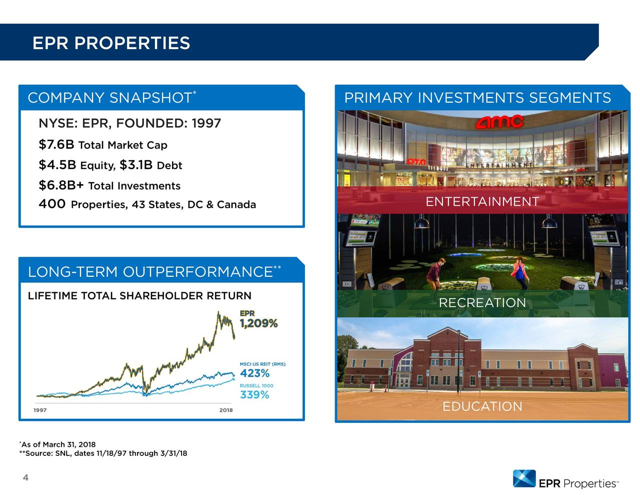 One of the REITs that makes dividend payments every month is EPR Properties (EPR), a REIT that primarily invests in properties from the entertainment, recreation, and education segments. EPR Properties is one of the larger REITs in this segment and its shares offer a quite high dividend yield of 5.7%. EPR Properties belongs to the broad retail REIT group, but it has a focus that is different from most other REITs in this segment, which includes giants such as Simon Property Group (SPG) and Realty Income (O). EPR Properties was founded a little bit more than 20 years ago, in 1997. Since then the company has grown into a giant that is valued at $5.9 billion right now. EPR Properties primarily invests in entertainment, recreation, and education properties across the United States and Canada. It operates a very different business model compared to companies such as Simon Property Group, which invests in malls and shopping centers, and Realty Income, which invests in single-tenant retail properties such as pharmacies. 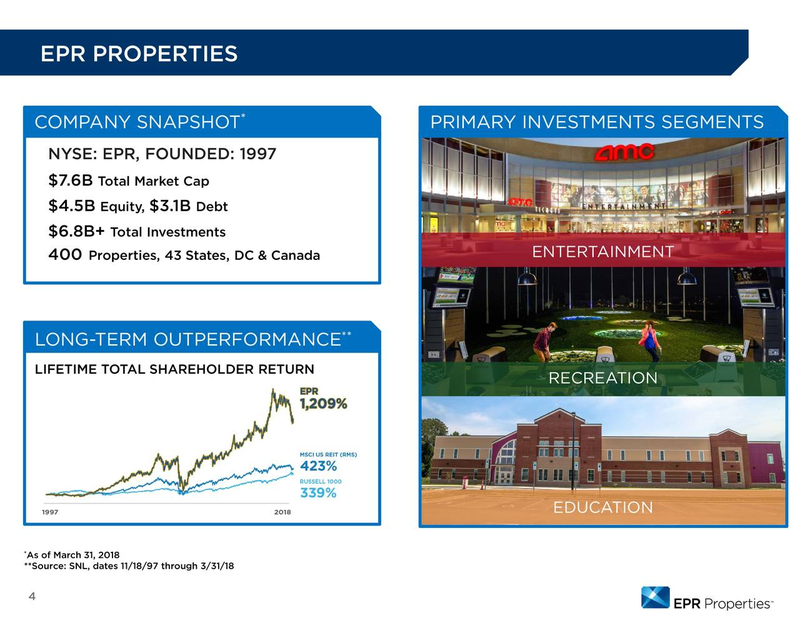 EPR Properties' assets are used as megaplex theaters, entertainment retail centers, family entertainment centers, golf complexes, ski areas, public charter schools, private schools, early childhood and education facilities. The rents that EPR Properties receives from its tenants as payment for providing the necessary real estate is quite stable, as there are long-lasting contracts that allow EPR Properties to generate rent proceeds whether the economy is doing well or not. 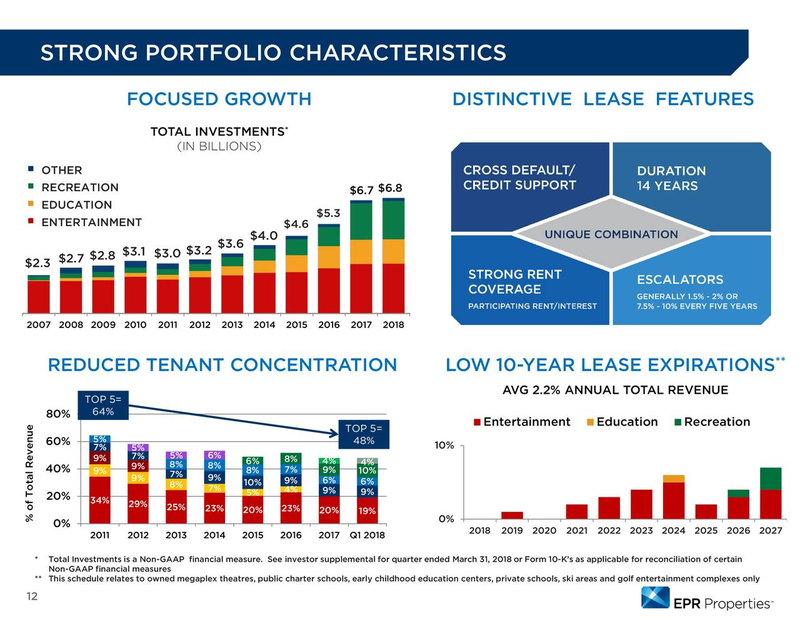 The average duration of EPR Properties’ leases is 14 years, which means that cash flows are highly stable, as not a lot of leases expire each year. A bankruptcy by EPR Properties’ tenants is quite unlikely, though, due to several reasons. First, the industries that EPR Properties serves are not prone to the Amazon (NASDAQ:AMZN) threat, as their services and offerings are not replicable online. There thus is high demand for the services that EPR Properties’ tenants offer, and that will likely remain the case going forward. The other reason for why a bankruptcy by EPR Properties’ tenants is unlikely is the solid profitability of these tenants. EPR Properties’ tenants, on average, have a rent coverage ratio of 1.74. This means that even if the EBITDAR of EPR Properties’ average tenant dropped by 43% over the next year – and there is no good reason why that should happen – EPR Properties’ tenants would still be able to fully cover all contracted lease payments. These two factors result in highly stable rent generation, unlike some other REITs, for e.g. CBL Properties (CBL), that serve other subsectors of the retail industry like the mall sector. EPR Properties should thus not have any problems with its tenants going forward. 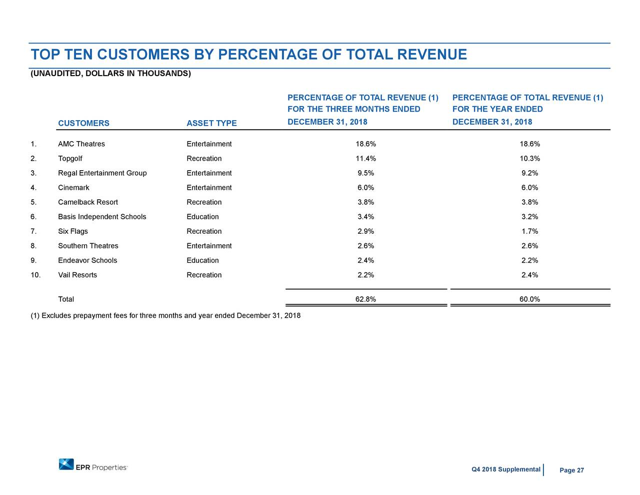 Tenants from the entertainment industry make up the majority of EPR Properties' tenant base, but none of the tenants is responsible for more than 20% of revenues, and the top 10 tenants make up just ~60% of total revenues combined. AMC Theaters, which is EPR Properties' top tenant, generating roughly 19% of EPR Properties' rents, is a publicly traded theater operator that is highly profitable. AMC Theaters has been able to grow attendance by 5% during the most recent quarter, which shows that consumers still flock to multiplex cinemas despite the availability of a multitude of streaming options. 2018 has been a highly successful year for the cinema industry, as global box office revenues totaled $41 billion, for a new all-time record. AMC Theaters is thus active in an industry that continues to experience growth, while at the same time AMC Theaters produces free cash flows of $300 million a year, which makes it very unlikely that the company will at any point not be able to pay the contracted rents to EPR Properties. In the above diagram, we see several positives about EPR Properties’ operations: EPR Properties states that its rent escalators usually are in the 1.5-2% per year range, which means that rents from existing properties rise, but not at a fast pace, unless there is a new contract with positive leasing spreads. The average duration of EPR Properties' leases is quite long, though, and there is only a small amount of lease expirations annually through the mid-2020s. EPR Properties’ management shows that leases equal to only 2.2% of the REIT’s average annual total revenue expire every year through the next decade. This means that EPR Properties does not have to worry about finding new tenants, as turnover is very low, but on the other hand, this limits the potential for EPR Properties to generate positive leasing spreads. The majority of EPR Properties' growth, therefore, comes from the development and acquisition of new properties. Through 2018 the REIT has invested almost $7 billion into new properties, more than $3 billion were invested between 2014 and 2018 alone (roughly $600 million annually on average). EPR Properties continues to invest for growth at a sizeable pace, the company forecasts that its growth investments will total $600 million to $800 million during 2019 alone. The REIT plans to divest $100 million to $200 million of assets during the same time frame, which results in net investments of ~$500 million annually. EPR Properties’ investments into new assets during 2019 are equal in size to ~9.3% of the company’s market capitalization. Growth investments are thus very meaningful on a relative basis versus the REIT’s size. This steep investment pace should grow EPR Properties' asset base meaningfully, and as a result of that, the REIT's rent proceeds and funds from operations should rise meaningfully as well. There are currently 15 properties under construction. 8 will be rented out for education purposes, 4 for recreation, and the remaining 3 will be rented to entertainment companies. Entertainment is still the biggest segment for EPR Properties, but with its development pipeline, the REIT is putting the focus on the education segment. 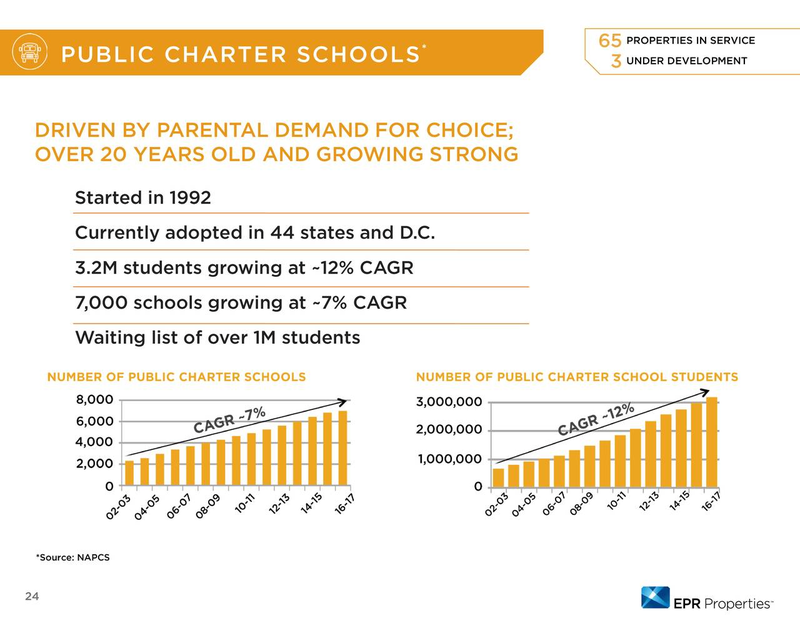 In the above charts, we see that demand for public charter schools has been growing very steadily over the recent past. As the charter school industry has experienced very consistent growth since the early 2000s, it looks like the industry is in a secular growth trend. There is no data on what exactly the number of charter schools may look like in 2020 or beyond, but funding for charter schools continues to rise, which bodes well for the number of schools in future years. Demand for places in public charter schools remains on the rise as well (and continues to outstrip supply), which means that public charter school operators will be inclined to open new schools over the years. EPR Properties’ decision to expand its asset base in this segment seems like an opportune move by the company. Both the entertainment sector as well as the education sector have one thing in common that they are insulated from the e-commerce trend that threatens the business model of mall-focused retail REITs. Education is not EPR Properties’ largest segment, but the REIT has been active in this industry since the early 1990s, and thus is very experienced regarding what to focus on in order to operate and grow this business successfully. 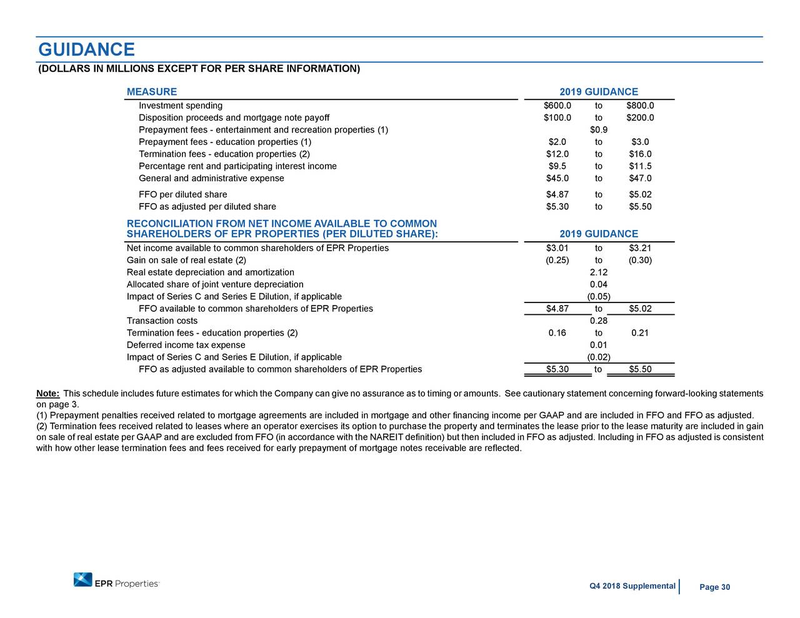 EPR Properties guides for adjusted funds from operations of $5.30 to $5.50 on a per-share basis, or $5.40 at the midpoint of the guidance range. During 2018, EPR Properties generated adjusted funds from operations of $6.10 per share, which means that FFO per share will decline by ~11% year over year. The decline is impacted by one-time items, though, the biggest one being the Och-Ziff prepayment during the second quarter of the last fiscal year. This $175-million payment by hedge fund Och-Ziff has led to outsized growth in EPR Properties' funds from operations during 2018, as funds from operations per share during 2018 were 22% higher than funds from operations per share during 2017. In order to adjust for 2018's one-time gains, we can look at the stacked growth rate, i.e. 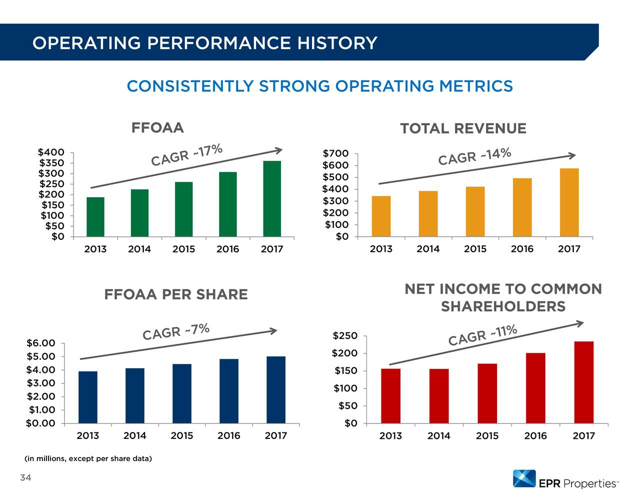 at the forecasted growth in EPR Properties' adjusted funds from operations between 2017 and 2019 in order to get a better picture about the REIT's underlying growth. Another way to adjust for the Och-Ziff payment is to adjust EPR Properties’ mortgage and finance income, which was artificially high during 2018, to the level it has been in 2016 and 2017. This gets us to estimated Och-Ziff-adjusted funds from operations of $5.26 per share for fiscal 2018 (all numbers from EPR Properties’ 10-K). This, in turn, means that funds from operations per share would rise by roughly 3.6% during 2019, assuming EPR Properties hits the midpoint of its guidance range during the current year. In 2017, EPR Properties has generated adjusted funds from operations of $5.03 per share, which means that adjusted funds from operations will grow by roughly 7.5% between 2017 and 2019, using the midpoint of management's guidance. This equates to an annual growth rate of ~3.7%, which is not overly high, yet still quite solid for a REIT with a high dividend yield. The stacked 2-year growth rate falls pretty much in line with the growth rate when we adjust for the Och-Ziff payment, which shows that EPR Properties is on track to deliver growth that is in line with its recent growth rates during the current fiscal year. EPR Properties has achieved a 7% annual funds from operations per share growth rate in the past, which shows management’s highly successful track record in terms of growing the REIT in a way that is beneficial for shareholders. Thanks to 2019's high investments into new properties, 2020's funds from operations will be even higher than the funds from operations that the REIT will generate during 2019. This is due to the fact that not all of the properties that EPR Properties invests in during 2019 will be available for leases during 2019, and even for those properties that are finished during the current year, they will only produce rents for a couple of months, not all of the fiscal year. Once all the new properties EPR Properties is investing in are up and running, their total company-wide rent generation will rise further above the current level. It is thus very reasonable to assume that EPR Properties’ funds from operations will experience further growth over the coming years, beyond 2019. If, for example, an investor targets an annual total return of 9% (which would be in line with the S&P 500’s historic return of 7%, adjusted for inflation), EPR Properties' share price would have to rise by just 3.3% annually in order for investors to hit this target. This assumes that multiples remain flat, though. EPR Properties trades at 14.6 times this year's funds from operations, which is neither an especially low valuation nor an especially high one. The average equity REIT trades at ~17 times funds from operations, which means that, compared to all other REITs, EPR Properties is more on the inexpensive side. It is not unusual for EPR Properties to trade at a discount versus the average equity REIT, though, which is why multiples will not necessarily rise going forward. In the past, EPR Properties has been mostly valued at price to FFO multiples of ~15, whereas the average equity REIT has traded at multiples of closer to ~17. Both are relatively in line with the current valuation for EPR Properties’ shares as well as for the shares of the average equity REIT. A flat multiple seems like a solid base-case assumption, though, which would mean that investors could count on total returns being in line with the sum of EPR Properties’ dividend yield and its FFO per share growth rate, i.e. somewhere in the high single-digits range. EPR Properties offers a high current dividend yield to investors, while the REIT's growth investments are poised to lead to higher funds from operations in future years. EPR Properties' focus on entertainment, education, and recreation will make the REIT resilient versus the trend of online shopping, as the services that are provided in EPR Properties' assets cannot be replicated online easily. 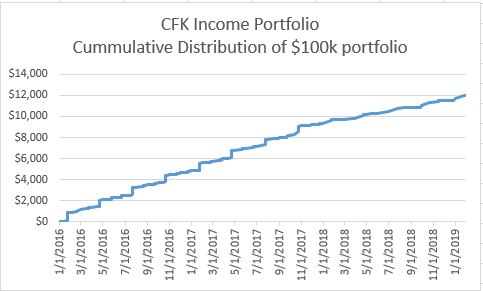 Cash Flow Kingdom would like to welcome Jonathan as a key contributing author specializing in the Blue Chip dividend sector. *Total return, expected forward yield, and income stream data provided by Etrade.